Just a modern day forbidden story. The president of a MC gang falls in love with a cop who is set out to take them down. That is until he’s made her feel things she’s never felt before. The black and white lines turn gray and we get to see that struggle for both of them as they try and decide if the other is worth the risk. Jillian has led a very sheltered life with her mom a protestor and works for the local church and father a cop. It’s no surprise that she would be attracted to someone like Zeek. He makes her feel alive and makes her seeing that there is more to life then just following the rules. There are going to be times when you won’t like Zeek. Some of the things he says are the same things that an abusive boyfriend would say to their girlfriend, and Jillian recognizes it. But like her, you just don’t care. You want to live on the edge. Take a walk on the wild side because that’s the only time that you will truly feel real. The last 10% go from 0-100 mph as we find out the truth about both of the problems that were plaguing them throughout the book (though both were predictable). Normally this is something that I don’t like to happen, but it works out well for this book because it sets up the sequel in a way that is going to make you want to keep reading. I wanted to jump right in but I stopped myself because I needed to write this before I start mixing stories. I can’t wait to see where this story is going to take us in the next book. I know that it’s going to be an exciting roller coaster ride that will have me hooked from page one to the end. 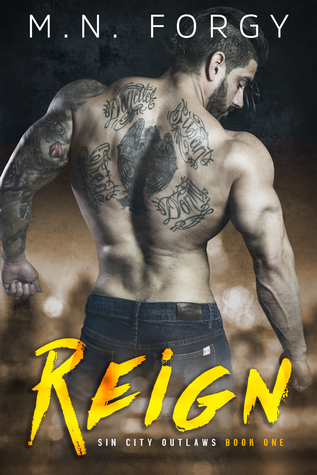 This entry was posted in Books and tagged MN Forgy, Reign, Sin City Outlaw.